My co-teacher told me on Monday that there was a rail bike trip for teachers on Thursday afternoon, did I want to go? I didn't know any details, but said sure! I guess in the fall and spring semester my school has an event for the teachers. I've been told that normally it's a 2-day trip, but this fall everyone's been so busy that they could only plan an evening trip. We left school around 14:50 on Thursday afternoon in a nice coach bus, with about 25 teachers on the bus (and our vice principal!). They gave us mandarins, water bottles, and kimbap once we took off. Nom nom. 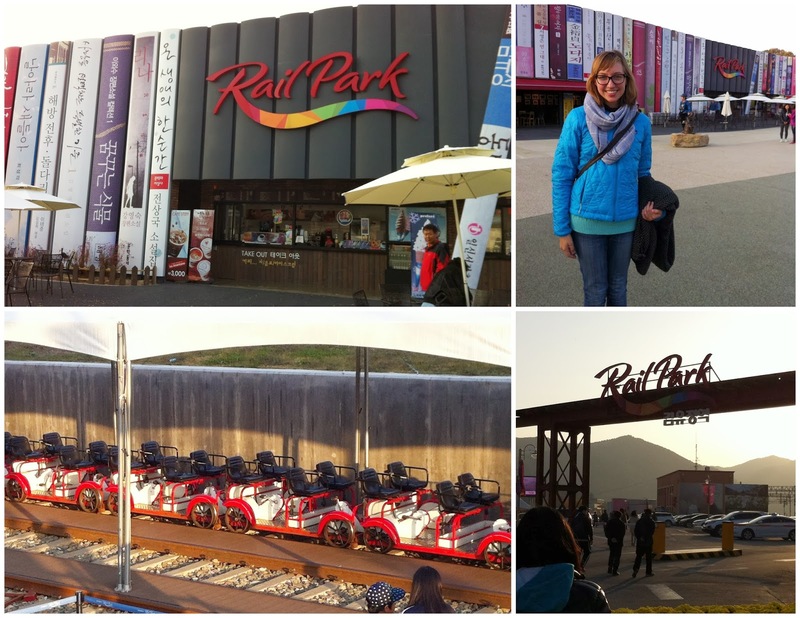 When we got to Gangchon Rail Park (about an hour and 10 minutes later), we had a half an hour to walk around before it was our turn to ride. This area was the birthplace of the famous Korean author Kim You-Jeong (1908-1937), so we visited his home near the rail park. Then we walked down the street to the actual Rail Park. There was a wall of giant books, all works of Kim You-Jeong, to decorate the park. When the clock struck 17:00 it was our turn to ride. The teachers split up into groups of four, leaving 6 of us at the end. For the first part of the ride I was with a group of four, and we were followed by just two teachers in a 4-person "bike". I was in the second row, so most of my photos have the backs of two heads in them! You couldn't go very fast, so once you're going faster than a crawl, pedaling wouldn't make you go any faster. At that point your feet didn't meet any resistance, like when you try to pedal on a real bike while going down a hill. Except we weren't going down a hill and we weren't going fast. You just wait until you needed to pedal again. 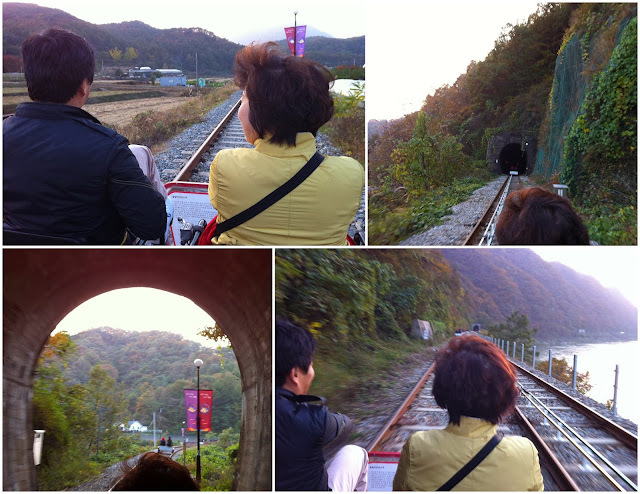 Korea's land is 70% mountains, so we had some nice scenic views along the ride. We went through a couple tunnels too, which had disco lights and music in them. There was a stop partway through where everyone had to get off the rail bikes. There were also some food stands at the stop. Many teachers bought cups of fish cakes in a hot broth. They would feed each other, poking fish pieces with a skewer and holding it up to someone's mouth. 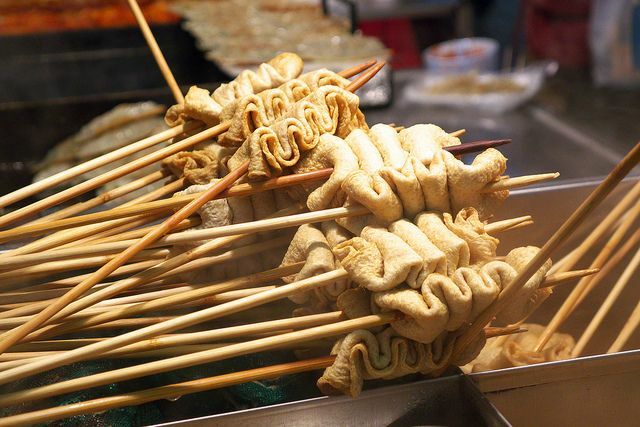 Update 2016: This tasty snack is actually called odeng (오뎅), and earned a spot in the street food chapter of my "Beginner's Guide to Korean Food and Restaurants." Yum! After the break when we got back on our rail bikes they had me move to the last bike of teachers, the one that only had two teachers in it for the first part of the ride. I sat in the front left, and the other two teachers were on the right side, front and back. I could definitely tell a difference now that no one was pedaling behind me, but I really enjoyed feeling the pedaling in my legs. There had been a "camera point" near the beginning of the ride. As we approached the camera, I saw the other teachers' hands rise up out of the corner of my eye, so I threw my hand up for a wave just as we passed the camera. The coach bus picked us up at the end point. We were on the bus for all of two minutes when it stopped; we'd arrived at the restaurant for dinner! This was my first time eating out with the teachers, but luckily I'd had some practice at a Korean restaurant with the badminton teachers back in September. I knew that as the youngest, I was supposed to pass out spoons and chopsticks to everyone at my end of the table. I think most of the other teachers were quite impressed when I did this, so it was nice to make a good impression with these teachers that I don't interact with day-to-day. The food was delicious. Above you can see the cabbage, chicken, and rice cakes just as the fire was turned on to cook them. Once it was cooked we ate out of that big bowl in the middle, sticking our chopsticks directly in - which is normal here. There were three cooking pot/bowls per table, so it was four people for one of the bowls pictured above. I could say more about the dinner and the drinking culture here, but I'll save that for another post -- or perhaps my next email update. It was nice to talk with some of the other teachers, who opened up and used whatever English they knew after some drinks of soju! I really appreciate their efforts to speak some English to me. The bus made two stops on the way home: at the first stop someone bought ice cream for everyone on the bus, as well as two more bottles of soju (I ate so much food today, by the way! We were constantly fed on this trip). We got back to school around 10pm and I was absolutely exhausted. Thankfully there was only Friday left in the work week, but I did not feel rested when I had to get up this morning.